A Twitter hashtag — #LoveBoston — was written on the sidewalk in Harvard Yard. 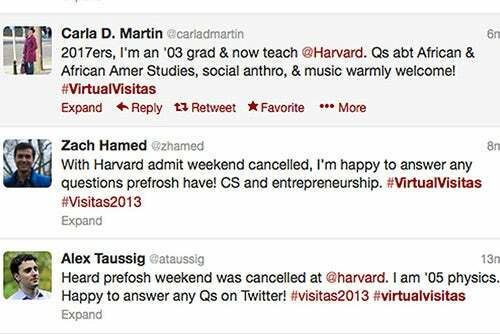 Members of the Harvard community later used the Twitter hashtag #virtualvisitas to reach out to incoming freshmen who had planned to attend Visitas, which was canceled due to the lockdown. William R. Fitzsimmons was running the Boston Marathon with his wife, Pat, on Monday when the downtown bombings forced them off the course at mile 20. On Friday, Harvard College’s dean of admissions and financial aid again was dealing with matters beyond his control, in this case an area-wide lockdown. He was greeting high school students at Logan Airport as they arrived for the College’s planned program for newly admitted students, Visitas. Nearly 1,400 students who had been accepted to Harvard, some of them coming from as far as Australia and India, were heading to Cambridge for three days of activities, before security officials decided to shut down the Boston area early Friday to hunt for the remaining marathon bombing suspect. The edict meant Harvard officials had to cancel Visitas. The annual weekend known as Visitas is a much-loved introduction to the Harvard experience. Admitted freshmen, often accompanied by family members, come for their first true taste of campus life. Students stay with hosts in the freshmen dorms and Harvard Houses. They attend parties, dances, lectures, panel discussions, and activity fairs. They eat in the dining halls and explore the University’s diverse academic and extracurricular offerings. As the day wore on, University officials, including Fitzsimmons and admissions officers and Visitas co-chairs Amelia Muller and Mike Esposito, held several conference calls to determine the event’s future. By noon, the decision had been made: Visitas was canceled. Saturday afternoon, Harvard President Drew Faust emailed a note to the prospective members of the Class of 2017, offering them her regrets at the change of plans, and encouraging them to make Harvard a part of their future. Melanie Slone, an admitted member of the class, left her hometown of Bellbrook, Ohio, at 6 a.m. Friday with her friend Jake Brewer, who had been admitted at Boston University, to make the long drive to visit the colleges they will soon call home. They were cruising through New York when Slone received an email from Harvard saying the weekend was canceled. Though they turned around and headed home, Slone seemed undeterred. “I’m still coming to Harvard next year, and I’m still very excited,” she said. While Visitas would have kicked off officially with an address from Faust, hundreds of early arriving students, many traveling with their parents, were already on their way. Many landed at Logan Friday morning. Noah Selsby, Harvard’s assistant dean for administration, who lives a 5-minute ride from the airport, headed to the international terminal. There, with help from Massport officials who put up signs directing those arriving to a section on the terminal’s ground floor, he began tracking down students and explaining the shutdown. Fitzsimmons soon joined him. 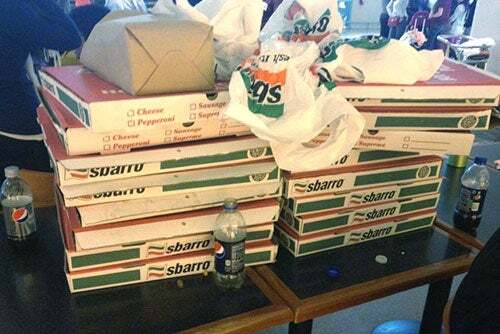 Together they ordered pizza for the approximately 85 students and close to 20 parents, helped some reschedule return flights for later that day, and found hotel rooms for the remainder. Gene Corbin, assistant dean of public service in the Office of Student Life, grabbed some colleagues, borrowed a number of vans from Harvard’s Phillips Brooks House, and hurried to the airport to help shuttle students to a Holiday Inn Express in Saugus. Michael Burke, registrar for Harvard’s Faculty of Art and Sciences, did the same with his car, as did Sean Palfrey, co-master of Adams House. Student Yusuph Mkangara arrived at Logan at 9 a.m. from Columbus, Ohio, with a friend who was also headed to Visitas. Knowing that the MBTA had already been shut down, they waited and checked their smartphones until they received an email from Harvard officials telling them to meet in Terminal E.
They arrived at the terminal’s “Camp Harvard” and shared pizza with other students while University officials helped them sort out their options. The resulting get-together wasn’t Visitas, but it was a little slice of Harvard nonetheless, Mkangara said. Though his spirits were high, Mkangara recognized he would have an even harder choice ahead of him as he decided between Harvard — which he had not visited — and Yale. Despite their disappointment, the students at Logan remained upbeat. They snapped pictures with potential future classmates and posted them to Facebook, and played impromptu “get to know you” games. Many of the students who were staying the night even opted for the Saugus hotel instead of one located at the airport, so they could continue bonding with their new friends. “They just wanted to stay together,” said Selsby. The afternoon and evening proved a lesson in character. As the head of Harvard admissions, Fitzsimmons said one of the qualities he looks for in prospective students is their ability to handle difficult situations. As the clock spun toward 9 p.m., Fitzsimmons and Selsby were still waiting for a young woman who was arriving from New Delhi. Suddenly, the weary student approached. “I’m delighted we found you,” exclaimed the dean. There were other developments concerning the new class in Harvard’s virtual world. Members of the Harvard community took to Twitter in force, using the hashtag #virtualvisitas, to reach out to the students. Throughout the day, tweets poured in from Harvard faculty, students, alumni, and staff who encouraged students with questions to get in touch. Like countless residents of the Greater Boston area, Harvard College Fellow Carla D. Martin was stuck inside monitoring the manhunt when she saw the Harvard tweet about #virtualvisitas. A 2003 graduate of the College who went on to earn her masters and her Ph.D. from Harvard, Martin tweeted out a note inviting members of the Class of 2017 to get in touch with questions about her specialties: African and African American studies, social anthropology, and music. Kirkland resident Ibrahim Khan was in Los Angeles with some of his Harvard roommates, headed to the music festival Coachella and using Twitter to follow the news in Boston, when he read a tweet about #virtualvisitas. “Harvard 2017ers, I’m a junior in Kirkland and happy to answer any questions you have. I hope you are all staying safe,” Khan tweeted out. While the University has no plans to reschedule Visitas, Fitzsimmons said he would consider extending the acceptance deadline beyond May 1 for students who had planned to attend the weekend event. In addition, the University will continue to connect with undecided incoming freshmen via email, phone, and social media, he said, to help them in any way possible. “We will do whatever we can to help them in making their decision,” said Fitzsimmons. Saturday morning brought together a group of of 18 from the Harvard College Marathon Challenge to run from the John Harvard Statue to the Freedom Trail in Boston. The group made a detour to the makeshift memorial for slain MIT police officer Sean Collier, who was gunned down Thursday night.